This morning, Apple announced the release of the iPhone 5. We can’t wait to get our hands on it. We plan to line up early. Really, really, really early. Want us to hold your place? TaskRabbits are standing by in New York and San Francisco to hold places in line on release day, Friday, September 21st. Reserve your spot today for just $55. Your assigned TaskRabbit will wait in line at your local Apple Store for up to 4 hours and swap places with you before you purchase the iPhone. Pretty sweet, huh? I want to skip the line! Not in these cities? No problem. Post a Task with your details here. It gets sweeter. Everyone who hires a TaskRabbit to wait in line at the Apple Store for this release will be entered to win a brand new iPhone 5. We’ll announce two winners on Thursday, September 20th. Don’t be like Brian, hire a TaskRabbit to wait in line for you today. 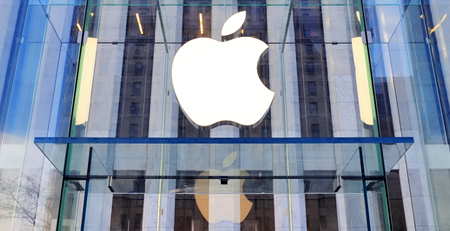 Long lines snaking around Apple’s brick-and-mortar stores are becoming synonymous with the company’s much-anticipated product launches. In addition to a lengthy wait, San Franciscans hoping to be among the first to boot up Apple’s third-generation iPad this morning also had to contend with some long overdue winter temperatures and a steady downpour. That’s where TaskRabbit came in. TaskPosters turned to us to get their iPads to avoid the lines and miserable weather. 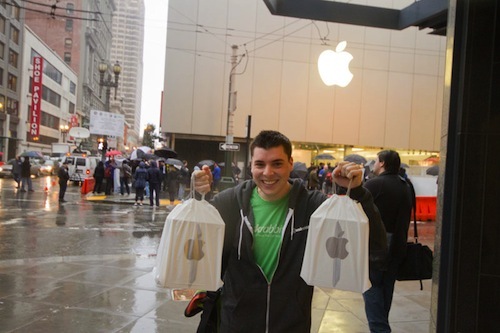 TaskRabbits were out in full-force at Apple’s downtown location (along with other locations around the Bay Area and those in New York City and Los Angeles), holding line spots, handing out doughnuts, and spreading that trademark TaskRabbit cheer.